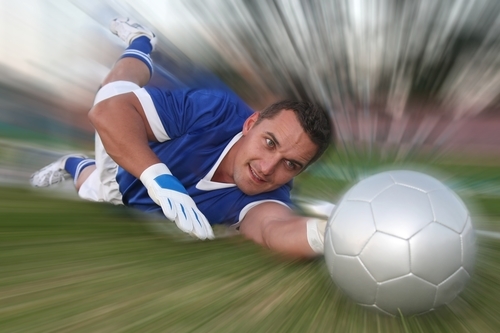 It has been said that a 5-a-side goalkeeper accounts for as much as 60% of the success of the entire team. Debate the number all you want, but the majority of players would agree: it’s the most important position on the court. The goalkeeper is the last line of defense; the guardian of the gate through which the ball must not pass. Do that job well and you’re a hero, but if you get it wrong it’s a different story. You’re a calamity, a loose-cannon that the rest of the team fear; their criticism only held back by the fact that none of them want to go in goal instead. 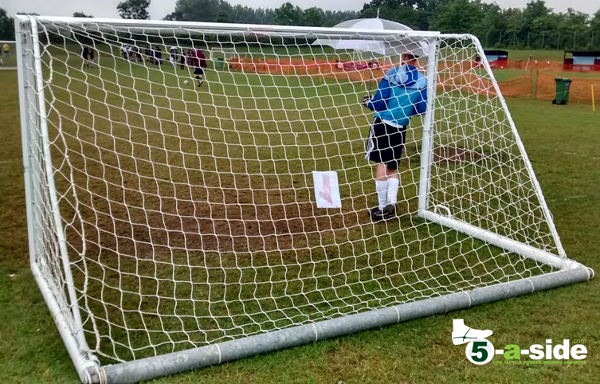 Goalkeeping duties in 5-a-side are all too often assigned to a reluctant outfield player, and it’s one of the main reasons why teams lose games. If you haven’t got a specialist keeper who wants to play in goal, it’s going to undermine a lot of the good work that the rest of the team does. 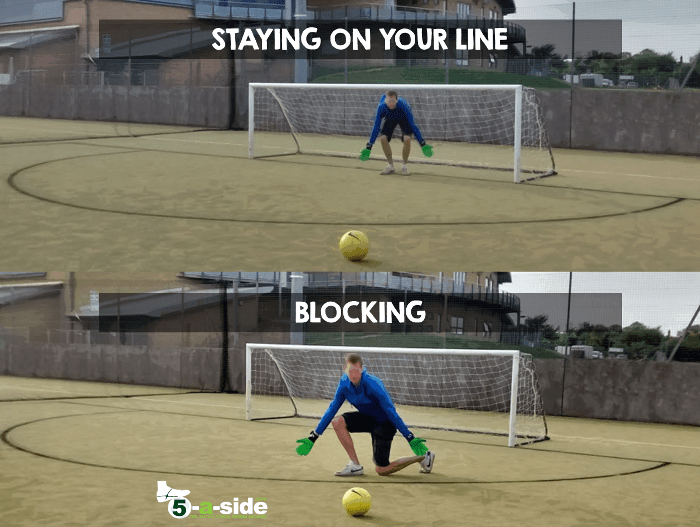 Whether you’re playing there because you love it, or whether you’re the reluctant stand-in, knowing the keys of good 5-a-side goalkeeping can dramatically improve your performance and transform you from a blundering butterfingers into the cat-like king of the court. Roger Paul Noveal, the man who they know on the 5-a-side circuit quite simply as ‘The Cat’. With nearly 20 years playing in goal for some of the best 5-a-side teams, and winning multiple national titles, he’s seen it all. 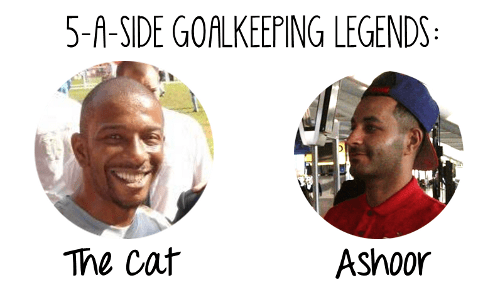 Ashoor – Goalkeeper for the most successful 5-a-side team of 2014, West 13. These guys won almost every major tournament that could be won, and it was thanks in no small part to having a quality goalkeeper between the sticks. 5-a-side isn’t like the 11-a-side game. The biggest difference for a goalkeeper – and also what makes so many of them love the smaller format – is the huge amount more action that they’re involved in. Players can, and very often do, shoot from absolutely anywhere. In the Premier League 2014/15 season, teams took an average of around 13 shots per 90-minute game. Only 4 of them were on target, leaving the goalkeeper with lots of quiet periods. In 5-a-side it couldn’t be more different: barely a minute goes by where you aren’t called into action. In 11-a-side you’re most worried as a keeper when the ball is anywhere near your 18-yard box, but 5-a-side is played almost as if the entire game is going on in this area. Because of the frantic nature of the game, there’s no time for leaning back on the crossbar and having a rest. 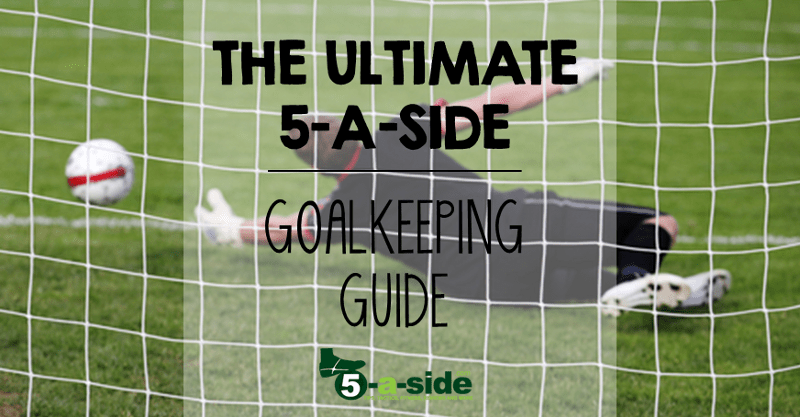 5-a-side goalkeeping should be every bit as exhausting as being an outfield player because you need to be alert all the time; constantly re-positioning yourself as the play unfolds. Get on your toes and be ready at any moment. The Cat Says: Anyone can lose the ball, at any time. If they do, you have to be ready to make a big save when your opponents break. When your team attacks, be prepared for that counter. Hope for the best but prepare for the worst. Ashoor Says: 11-a-side goalkeepers should get involved with more 5-a-side because it really improves your reactions, movement and awareness. In 11-a-side you’re not getting tested two or three times every minute. Ever since the first goalkeeper boldly took up his position between the posts, the goalkeeping profession has been associated with people who were just a little bit crazy. But if the 11-a-side keeper can be described as slightly mad, the 5-a-side keeper would almost be candidate for sectioning under the Mental Health Act – they take craziness to a whole new level. It takes a special sort of individual who is happy to place his body on the line to keep goal in 5-a-side. A lot of the time we’re not talking about glamorous, slow-motion, fingertip saves you might see on TV with keepers at full stretch turning shots round the post from 30 yards. 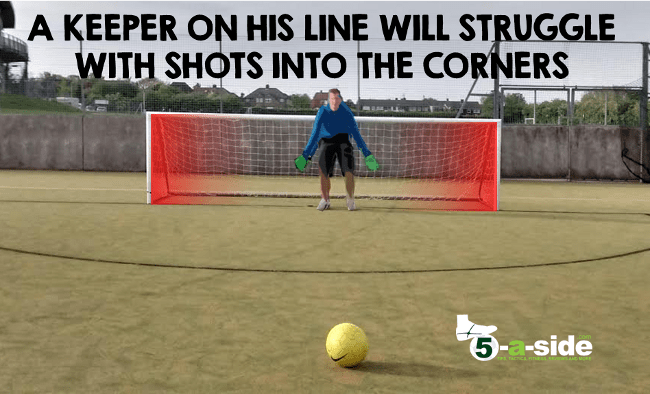 No, most of the shots coming a 5-a-side goalkeeper’s way are struck from close range, usually requiring saving through nothing but pure instinct. Shots are fired at your body, your legs, your head, and eventually any keeper worth his salt will end up taking a couple in the crown jewels too. Getting enough padding and wearing finger-protection gloves can help players feel more comfortable, but at the end of the day it’s more about having the minerals for the job. At times, you’re going to need balls the size of coconuts…. coconuts made of steel, ideally. If you’re fearful of doing whatever it takes to keep the ball out of your net, you might as well give up now. The Cat Says: Players will strike the ball so hard from point blank range and if you’re not brave, you’ll pull out and they’ll score. From that point, they’ll smell your fear, and then they’ve got you. So you need a no-fear element to your game as a keeper. I don’t care what injury I get as long as I don’t let them score. I’ve saved a fair few penalties with my face! Fortunately, the 5-a-side goalkeeper usually has a D-shaped area in which he operates, and this should be used to its full extent. If there’s an opponent bearing down on goal, you want to be right out on the edge of the area shutting down the angle. You might choose to use a different technique, but it just goes to show how much more of the goal you can cover by coming off your line. The Cat Says: 5-a-side goals are smaller than 11-a-side goals, but if your positioning isn’t good, you’ll be picking the ball out of the net all too often. My golden rule is that you should never get beaten on your near post. When a player goes down either wing you might need to take one or two steps off your line so that you don’t get caught on the near post or across your goal – players are often taught to shoot across the goal. Ashoor Says: you have to know when to come out and how to make the angle to give yourself a chance to stop them scoring. These shots are coming at you at such a fast pace and sometimes it might just hit your body and that’s still a save, but it only comes about because of your positioning. Stay low so that you’re ready to deal with any shots that come your way: the 5-a-side keeper has the luxury not to need to worry about shots above waist-height. If you’re beaten it will be low-down, and if your stance is bolt-upright it’s going to take you longer to get down to any shots. Understand the difference between ‘blocking’ and ‘saving’: ‘Saving’ is where you’re dealing with shots coming from distance – where you get at least a split second to think about how you might deal with it, often diving to get a hand on it. ‘Blocking’, however, is the more common technique for 5-a-side and that’s where you simply throw yourself in front of a shot – nearly always from close-range – trying to give them as little of the goal as possible to aim for. Blocking can be done by going to ground, or by taking up more of a kneeling position (the advantage being that it’s easier to react to the shot-fake in the latter position). 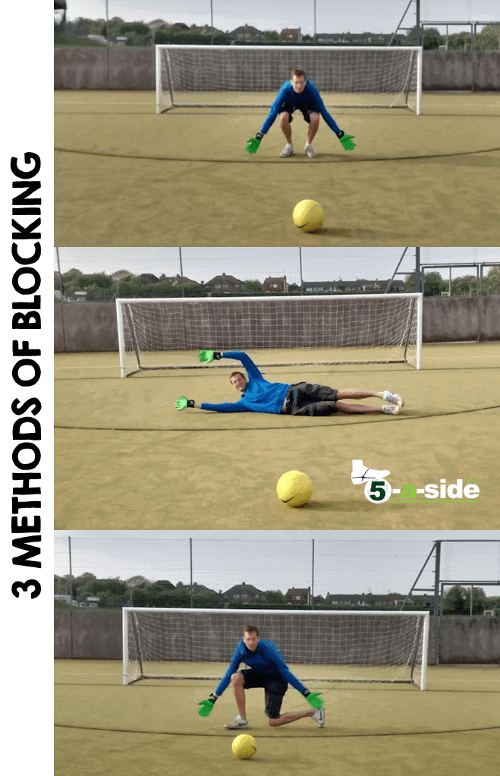 Pick a blocking technique that works for you and develop it – it’s going to be a vital part of your goalkeeping toolkit. Make maximum use of your feet: In 5-a-side there simply isn’t time to think about most of the shots that come your way, and in a lot of cases you won’t even have time to dive, let alone make a catch. It’s often a lot quicker to stretch a leg out to the side than it is to dive down to make the save with your hand. If you can turn your feet outwards as you make contact then this should allow you to get a solid block on the ball, repelling it well away from the goal. Ashoor Says: Some of the shots are coming from less than five yards away and they’re being blasted with as much power as they can possibly generate so it’s impossible to catch them. It’s a very low percentage of shots that you’ll actually catch during a game. It’s more important to just get something on it and stop the ball going in the net. If you catch it, that’s a bonus. It goes without saying that the more agile you are, the quicker you can respond to shots, even dodgy deflections, that come your way. The Cat Says: Here’s a great drill to improve your agility as a 5-a-side keeper. Get a player to hit the ball low to your left so that by diving you’ll get a hand to it – no need to catch it, just get a hand to turn it round the post. Then repeat, and each time get slightly faster so that eventually you’re diving and the ball flies past your hand because you aren’t fast enough to get down to the ground. Do 10 of these on your left and then the same on the right side. As a goalkeeper, you don’t want the opposition to have any shots at you at all – you don’t even want them getting the scent of an opportunity. You might think that there’s not much you can do about what happens outside of your area as a goalkeeper, but you’d be wrong. If a goalkeeper can communicate effectively with their teammates – in a clear and helpful way – he can snuff out shots before they’ve ever been taken. This involves ensuring that your players don’t switch off, and that they pick up the opposition players. Crucially, you don’t want your teammates to let the other team have any shooting opportunities that come from the middle of the pitch – instead, encourage them to show their opponents wide, where you have a much better chance of narrowing the angle and making the save. If you can mould one or two trusty defenders to respond to your instructions that will help immensely. When the ball gets anywhere near your area they almost become keepers themselves, throwing their body in the way to make the block, although they obviously can’t use their hands. Ashoor Says: There are times when you’ll concede a goal and your player will look round as if to say ‘come on, you could’ve saved that’, but they don’t think that a moment or two before that they could’ve stopped it happening. Even when the opposition’s keeper has got the ball, I’m trying to think how I can help my teammates to stop them from getting a shot on me. That’s especially important in a tense match where players are so focused on their own game that they switch off. The Cat Says: As a keeper you see everything and, if you can, tell your team-mates what’s going on. Just a little call like ‘man on’ or ‘time’ will really help them. The better you can help them play, the easier your job is. For every wonder-save that gets made on the 5-a-side court, it seems there’s another goal that’s given away from poor distribution. You know the situation: the keeper is looking around thinking “who do I throw it out to?”, but none of his teammates seem to be moving. Eventually out of impatience he chucks it at one of his players who loses it and the opposition end up scoring a cheap goal. Getting distribution right is about three things: players moving for you, having the patience to wait for this to happen (or at least giving them this instruction), and then giving them a quality roll-out. Ashoor Says: When I’ve got the ball, sometimes everyone just runs towards me, but I’m not giving it to anyone whilst they’re all on top of me. It only takes a second to lose it and I might concede a goal. Talking to the players and telling them you want one left, one right, one up top and one in the middle helps. I see so many keepers with the ball just looking round, not even talking, then they just roll it out into trouble and the next thing a goal goes in. That’s so disheartening. The Cat Says: If you can distribute the ball correctly, your player can strike that ball before he’s even controlled it. Make sure that the player receiving it gets it exactly the way he wants it, give it to his stronger foot and make sure that it rolls nice and flat along the floor. Think about the action for flat-green bowling: it’s perfect. You release the ball nice and low to the floor, so that from the moment it leaves your hand it’s already rolling nice and flat. A lot of the keepers are just chucking it at their players giving them a bouncing ball. Pass it to them in a smooth flowing way so they don’t have to spend time controlling it. Roll the ball out a little like this, nice and low to the floor. Minus the intense facial expression. Lawn bowls image used under creative commons license courtesy of Wikipedia. These are great tips, i have only recently been playing as a goalkeeper for 3- 4 years in 5 aside, everything here i do but my problem is mostly when a player shoots through a defenders legs or when they come 1 v 1, i seem to hesitate since the player comes at you with speed (i think things just start getting hazy) and tend to misjudge what to do causing goals to get past. like you said its about positioning but also im wondering how do you know when to come out off your line. also know of any coaches looking to teach a goalkeeper? I don’t know that there are any coaches around to train keepers – best to look online for something in your local area. Good luck! Just wondering if you would recommend using the futsal “split save” technique during a 5 a side on Astro turf? I seem to let all of my goals in when they are placed in the bottom corner, and am wondering if this technique can be applied for wider goals like the low ones in 5 a side or is it better to dive for the corners and hope to get a hand to it? Haven’t played football for 25 years and last monday we joined a 6 a side league. I went in goal as no.one else wanted to and I have done it before. Very unfit but had a good game. Even saved a penalty with the face. Nice to be back in the game. Some nice tips here that i used. Hi Lee, I love to hear this. It’s great that you’ve got back into football – really is one of the best things you can do. My own experience is that playing in goal, if you’re doing it properly, is a real workout. So hopefully the fitness will come back soon! Glad you found these tips useful. I have played in goal for 5 aside for 20 plus years, I’m 43 and still love what I do. Reading this article makes me realise that a lot of the techniques I use are correct and thus without ever being coaches them, they just come through natural instinct. I have always said you need to be insane to play in goal in 5 aside and it’s good to know I am not the only one with this train of thought. It made be chuckle reading hiw to distribute the ball as I have also played flat green bowls for 20 plus years and never associated a connection between the two sports before. 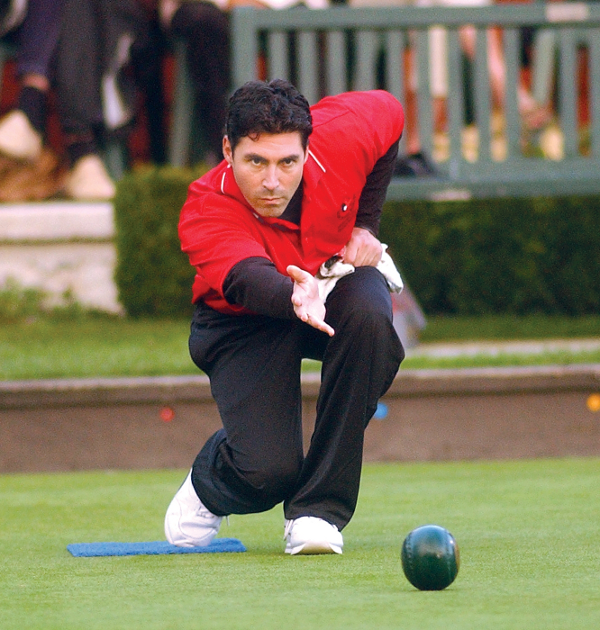 I often use a side throw when needing to generate a more powerful delivery to a player and wonder if using this method on a bowling green would raise a few eyebrows. Really enjoyed this guide and the advice from the two specialist experts and will look to improve my own game taking on board what has been mentioned. One thing I thing to add to this is you need to ensure you have a good pair of gloves with a lot of padding on them and some form of finger protection. As a lot of the shots are powerful and close ranged this helps reduce a lot damage to your hands and fingers. Stewie, Thanks for the comment. I really like a lot of the things you said – it’s good to hear from a person with experience! I’ve got a great image of you side-throwing a bowling ball on a bowling ball. By the way, I think there is room for a side throw occasionally (in 5-a-side) when it really does require more power to reach a player, but he’s got a bit more time to control it. Great point about the gloves. That is terrible! Definitely makes you think about getting some decent gloves. I have played in goal since I was 7, I am now 32. Mainly 11 a side, but I did have a stint 8 years ago where I played 5 a side two or three times a week and loved it. It’s actually quite strange as the game seems to have changed somewhat and the youngsters of today seem a lot more skillful and they seem to smash the ball at goal a lot lot harder than I remember too. Anyway had a bit of a culture shock having not played in so long. Generally done ok but let in a few soft ones so glad I came across this site. Think my reactions need a fine tune, but mainly I find I get beaten across my body, so going to read through this again and get some pointers. Need to get lower I think and play a little off my line more. I think part of the problem is because I usually play 11 a side and I am 5’7″ I am so used to playing back a bit more to try and avoid being lobbed and as such this has become a part of my game even in 5 a side. Cheers for making such a comprehensive 5 a side keeping guide. Jim, thanks for the kind words. I fully agree with you, 5-a-side goalkeeping is a lot of fun because it’s non-stop action! The standard probably has raised in 5-a-side over the last decade or so. People used to talk about the English not having very good technique, but it’s much better these days. Or maybe it’s just that we’re getting old and they seem better! Stopping the ones across the goal is definitely a matter of positioning. If you stay on your line then you’ll really struggle so, as you say, it’s all about getting out and narrowing those angles to a gap that you can cover more easily. Best of luck over the next few weeks as you find your 5-a-side range again! This is certainly a very interesting and informative read but I had one question. I sometimes find that I’m guilty of diving just a shout second too early and it turns out to be the wrong decision. Sometimes I’m lucky and get a block of with my feet but I always find I dive better on my right side which is also my stronger side. After all that, are there any tips for cutting our that early dive? Hi Nahid, thanks for the comment. It’s common to have one side that you feel most comfortable diving on. I’m not sure what exactly to suggest for your early diving problem, but perhaps you just need to try to train yourself to stay up that split second longer. You could do this just by being a bit more conscious about what you’re doing in a game, or you could get your teammates to take some practice shots at you, allowing you to work at it. Personally, I’d keep in mind that you needn’t be diving that much in 5-a-side if you’re using a lot of the blocking techniques we have covered. The legs are very effective at getting wide shots – think of the way that David De Gea uses his. Best of luck. One thing I’ve noticed is how important gloves are. I borrowed cheap gloves off of people to play in goal. Recently I’ve decided to play in goal full time due to a knee injury, and spent around £40 quid on gloves, the difference is amazing. I almost don’t need to think about my hands anymore, the gloves keep them strong and in position. For anyone looking to play in goal long term, I’d recommend investing in a decent pair of gloves!! Paul – thanks for the tip. Perhaps I need to do an article on that! Great advice, I began goalkeeping for the past two weeks and have been moderately successful. One issue I have is positioning. I tend to stick near the edge of my box to close down the space the attacking team have to shoot in. This unfortunately can lead to my saving the ball outside my box or going outside the box when diving low to block a shot. How close to the edge of the D do you reckon I should be? I’m glad that you’ve made a good start to goalkeeping. These tips really work. You’re doing exactly the right thing by not staying on your line and instead coming out to make the block, so keep doing it, especially where the attacker with the ball is getting near to goal. If you’re finding that you’re coming out a bit too much, just take half a step back. Over time you’ll start to learn where the boundaries are, almost instinctively. Make sure that you’re getting familiar sidestepping within the edge of the D, following the curve and not in straight lines. Sounds like you’ve made a great start. I think you’ll pick it up quickly. Come back and let us know how you get on. Really great article, thanks. One problem I’ve had a bit is too many goals going in across me, I think this is partly because like the cat I’m desperate not to concede at my near post. I might try changing my starting position by coming forward a couple of paces as suggested and see how that goes! That would be my solution, John, where it’s possible. Let us know how you get on with that. We’d all be interested to hear if that makes an improvement. Nice tips! Played a lot 5/6/7-a-side leagues in goal over the years and all these resonate with me. Cheers Ian. Do let us know if you’ve picked up any other nuggets that might be helpful, from all those games. Would be happy to add to this. 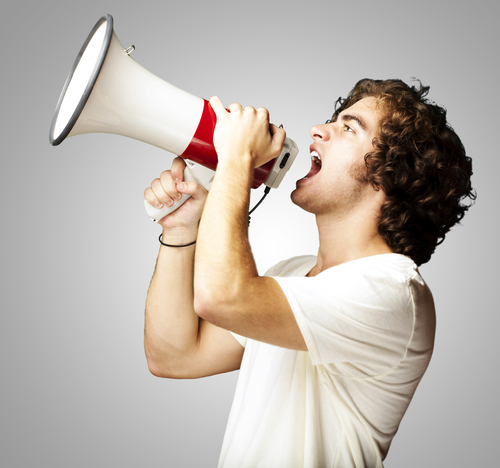 Great article that I’ve been waiting ages to see appear on your site Gaffer! I’ve played in goal now for about 5-6 years and love the responsibility / gratitude you get from team mates for a) being in goal but more importantly b) taking it seriously and always looking to improve. Ive gone from almost last pick ten years ago to often getting invites to tournaments when teams are really looking to try and win their competitions. I hope though that this article is only the start and not a one-off. I would love to see some more tips from the Cat and Azoor about things such as how to play when an area is available versus situations like seven-a-side when everyone is allowed into the box. Tips on starfishing, best gloves to use etc. would really continue elevating this excellent site beyond the others. Jairo, thanks for the comment. It:s great to have an experienced goalkeeper reading and enjoying the site. I think you’ve got some great ideas there for future posts so I’ll try to tackle them over the next few months. Excellent guide. I’ve been called on a lot over the years to provide cover in goal, though that’s not my main position. The tips you’ve given really do help – at least the ones I’ve already tried – looking forward to trying some of the others. I do agree that a good goalkeeper is the foundation of a good team. Thanks Adam, I hope this helps you do even better next time you’re called on!